(Bloomberg) -- Longest bull market ever. Two trillion-dollar companies. Now you can add strongest rally ever during a tightening cycle to the list of milestones for U.S. stocks. Since the first post-crisis Federal Reserve rate hike in December 2015, the S&P 500 Index has gained 41 percent. 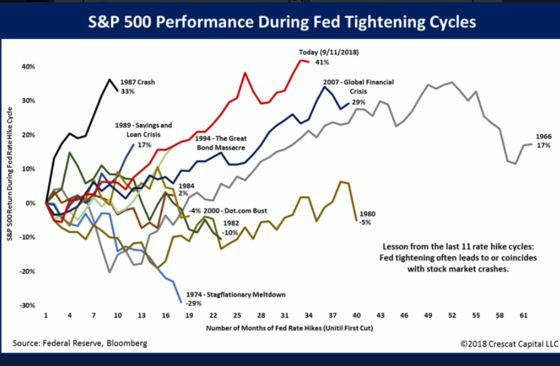 That puts this cycle’s rally in the top spot when compared with historical equity advances as the Fed hiked borrowing costs, according to Crescat Capital. The downfall that has often followed these rallies in the past could be cause for concern. The second-strongest rally came before the crash of 1987, with the S&P 500 rising 33 percent between the first interest rate increase and the first cut. The Fed has raised seven times since 2015 and analysts predict it’s set to boost rates again when the central bank’s open market committee meets this month. Klaus Baader, the global chief economist at Societe Generale SA, says risks are growing as the global economic expansion ages. Factors include trade tensions, emerging-market fragility, and monetary policy tightening. About 10 years of persistently low interest rates and quantitative easing may make this time around different. As for how much longer the stock market can run, that will be a function of the central bank’s policies, according to Joseph LaVorgna, the chief economist for the Americas at Natixis.